Every day brings more and more evidence that Obamanomics is failing in Europe. I wrote some “Observations on the European Farce” last week, but the news this morning is even more surreal. 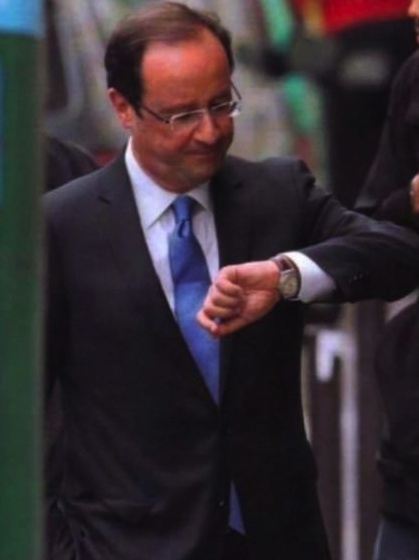 Compared to his foolishness on tax policy, Hollande is a genius when it comes to determining what time it is. Let’s start with France, where I endorsed the explicit socialist over the implicit socialist precisely because of a morbid desire to see a nation commit faster economic suicide. Well, Monsieur Hollande isn’t disappointing me. Let’s look at some of his new initiatives, as reported by Tax-News.com. The French Minister responsible for Parliamentary Relations Alain Vidalies has recently conceded that EUR10bn (USD12.7bn) is needed to balance the country’s budget this year, to be achieved notably by means of implementing a number of emergency tax measures. …The government plans to abolish the exemption from social contributions applicable to overtime hours, expected to yield a gain for the state of around EUR3.2bn, and to subject overtime hours to taxation, predicted to realize approximately EUR1.4bn in additional revenues. Other proposed measures include plans to reform the country’s solidarity tax on wealth (ISF), to cap tax breaks at EUR10,000, to impose a 3% tax on dividends and to increase inheritance tax as well as the tax on donations. …French President Hollande announced plans during his election campaign to reform ISF. Holland intends to restore the wealth tax scale of between 0.55% and 1.8%, in place before the former government’s 2011 reform, to be applied on wealth in excess of EUR1.3m. Currently a 0.25% rate is imposed on net taxable wealth in excess of EUR1.3m and 0.5% on net taxable assets above EUR3m. France already has the highest tax burden of any non-Scandinavian nation, so why not further squeeze the productive sector. That’s bound to boost jobs and competitiveness, right? And more revenue as well! In reality, the Laffer Curve will kick in because France’s dwindling productive class isn’t going to passively submit as the political jackals start looking for a new meal. But while France is driving into a fiscal cul-de-sac, Italian politicians have constructed a very impressive maze of red tape, intervention, and regulation. From the Wall Street Journal, here is just a sampling of the idiotic rules that paralyze job creators and entrepreneurs. Once you hire employee 11, you must submit an annual self-assessment to the national authorities outlining every possible health and safety hazard to which your employees might be subject. These include work-related stress and stress caused by age, gender and racial differences. …Once you hire your 16th employee, national unions can set up shop, and workers may elect their own separate representatives. As your company grows, so does the number of required employee representatives, each of whom is entitled to eight hours of paid leave monthly to fulfill union or works-council duties. …Hire No. 16 also means that your next recruit must qualify as disabled. By the time your firm hires its 51st worker, 7% of the payroll must be handicapped in some way, or else your company owes fees in kind. …Once you hire your 101st employee, you must submit a report every two years on the gender-dynamics within the company. This must include a tabulation of the men and women employed in each production unit, their functions and level within the company, details of their compensation and benefits, and dates and reasons for recruitments, promotions and transfers, as well as the estimated revenue impact. …All of these protections and assurances, along with the bureaucracies that oversee them, subtract 47.6% from the average Italian wage, according to the OECD. …which may explain the temptation to stay small and keep as much of your business as possible off the books. This gray- and black-market accounts for more than a quarter of the Italian economy. It also helps account for unemployment at a 12-year high of 10%, and GDP forecast to contract 1.3% this year. You won’t be surprised to learn that the unelected Prime Minister of Italy, Mr. Monti, isn’t really trying to fix any of this nonsense and instead is agitating for more bailouts from taxpayers in countries that aren’t quite as corrupt and strangled by red tape. Monti also is a big supporter of eurobonds, which make a lot of sense if you’re the type of person who likes co-signing loans for your unemployed alcoholic cousin with a gambling addiction. But let’s not forget our Greek friends, the one from the country that subsidizes pedophiles and requires stool samples from entrepreneurs applying to set up online companies. The recent elections resulted in a victory for the supposedly conservative party, so what did the new government announce? A flat tax to boost growth? Sweeping deregulation to get rid of the absurd rules that strangle entrepreneurship? You must be smoking crack to even ask such questions. In addition to whining for further handouts from taxpayers in other nations, the Wall Street Journal reports that the new government has announced that it won’t be pruning any bureaucrats from the country’s bloated government workforce. Greece’s new three-party coalition government on Thursday ruled out massive public-sector layoffs, a move that could help pacify restive trade unions… The new government’s refusal to slash public payrolls and its demands to renegotiate its loan deal comes just as euro-zone finance ministers meet in Luxembourg to discuss Greece’s troubled overhauls—and possibly weigh a two-year extension the new government is seeking in a bid to ease the terms of the austerity program that has accompanied the bailout. …Cutting the size of the public sector has been a top demand by Greece’s creditors—the European Union, European Central Bank and International Monetary Fund—to reduce costs and help Greece meet its budget-deficit targets needed for the country to get more financing. So far, Greece has laid off just a few hundred workers and failed to implement a so-called labor reserve last year, which foresaw slashing the public sector by 30,000 workers. Gee, isn’t this just peachy. Best of all, thank to the International Monetary Fund, the rest of us are helping to subsidize these Greek moochers. And speaking of the IMF, I never realized those overpaid bureaucrats (and they’re also exempt from tax!) are closet comedians. They must be a bunch of jokers, I’ve concluded, because they just released a report on problems in the eurozone without once mentioning excessive government spending or high tax burdens. The tax-free IMF bureaucrats do claim that “Important actions have been taken,” but they’re talking about bailouts and easy money. The ECB has lowered policy rates and conducted special liquidity interventions to address immediate bank funding pressures and avert an even more rapid escalation of the crisis. Absent collective mechanisms to break these adverse feedback loops, the crisis has spilled across euro area countries. Contagion from further intensification of the crisis—including acute stress in funding markets and tensions involving systemically-important banks—would be sizeable globally. And spillovers to neighboring EU economies would be particularly large. A more determined and forceful collective response is needed. Let’s translate this into plain English: The IMF wants more money from American taxpayers (and other victimized producers elsewhere in the world) to subsidize the types of statist policies that are described above in places such as France, Italy, and Greece. I’ve previously explained why conspiracy theories are silly, but we’ve gotten to the point where I can forgive people for thinking that politicians and bureaucrats are deliberately trying to turn Europe into some sort of statist Dystopia. Hi Dan, it certainly looks like the Fabians’ strategy, started over 100 years ago, has worked!! Repeating the same actions over & over again, while expecting a different result each time. The world is being run by the inmates of the asylum, and they keep being returned to power by the promise of more ‘goodies’. Europe: A kaleidoscopic succession of certitudes imposed ex libris. Unfortunately most American voters react to such observations with a sense of relief. Relief that America seems a long way from the selected extremes described for France, Italy, Greece. But that is not the important point. Once the point of no return has been crossed, the irreversible path to Euro-decline becomes inevitable. Europe did not arrive to this point overnight, but rather, through the predictable, inevitable and relentless application of what Mr. Mitchell refers to as [the voter dynamics of] “Mitchell’s Law”. As the “care packages” you voted for in the previous election suppress production amongst both exceptional and mediocre, the resulting economic stress make voting for the next “care packages” irresistible and inevitable at the polls. America is not too many iterations of “Mitchell’s Law” away from the “French equilibrium to steady decline” state. Initially the pace of decline is slow, but once the tipping point is crossed then, with every iteration of the electoral cycle the decline not only continues, but inevitably accelerates. There are not enough shocking events ahead for Americans (though Europe may surprise us in the next few years) to arrest this decline. HopNChange will run its predictable course. The tipping point has been crossed. We are now in line for the more pernicious de-motivators to start kicking in soon. First major milestone towards Francification: ObamaCare, as it kicks in full force with its full range of dis-incentivizers in 2014. In ten-fifteen years what we laugh at today in France, Italy and Greece will look logical to a majority of American voters. America’s age of prosperity will be over. Plan accordingly. Exit taxes and extra-territorial taxation will become dominant issues. Alas, good luck in ten-twenty years, convincing declining pitch-forkers to refrain from self-destructive attitudes. History will play its broken record once again. Reblogged this on Common Sense. Actually the last article I saw in the WSJ on Monti says the opposite of what you say: that he has done more deregulating in a few months than was done in the previous 10 years. You have to realize that most Italians are firmly convinced that deregulation, whether desirable or not, is impossible. That is a self fulfilling prophecy. So let’s keep kicking Monti in the backside, but let’s also give him a bit of slack. You also have to try to keep in mind that Italy has not received a bailout: on the contrary, it has contributed to bailouts of Greece (how many times? ), Ireland, Portugal, and Spain. No doubt Italians would like to be bailed out, but since Italy is too big to bail out, it seems unlikely that Monti is agitating for more bailouts for other countries, that he would have to pay for. A spicy stew of economic stupidity. I blame birth control. If the natural law was followed these people would have dealt with the results of the procreative function. This would have left them to encounter the toddler behavior they are now exhibiting. Toddlers want to know the rules, and are always pushing the boundaries to find those rules. These twits must know you cannot lash down the productive with these “well meant” rules, and are looking for someone/something to assert reality. The next bit will not be fun.